Guess why your roads can’t get fixed? See the chart below for what gets close to $6 million dollars this year! Remember when Markowitz said it would never cost you a dime? 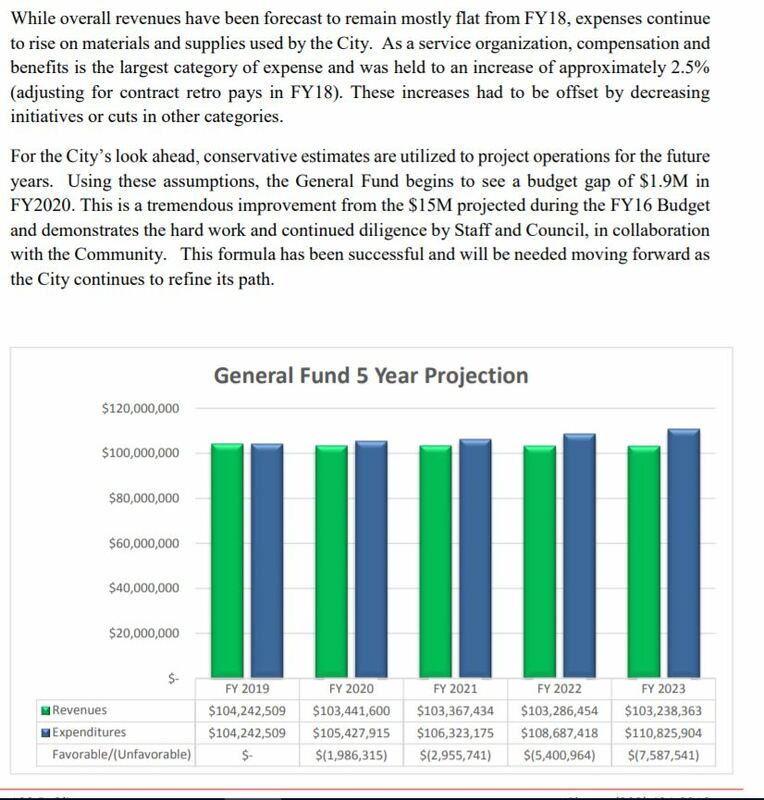 When the budget was done, the City was expecting to lose $500,000 to the State. 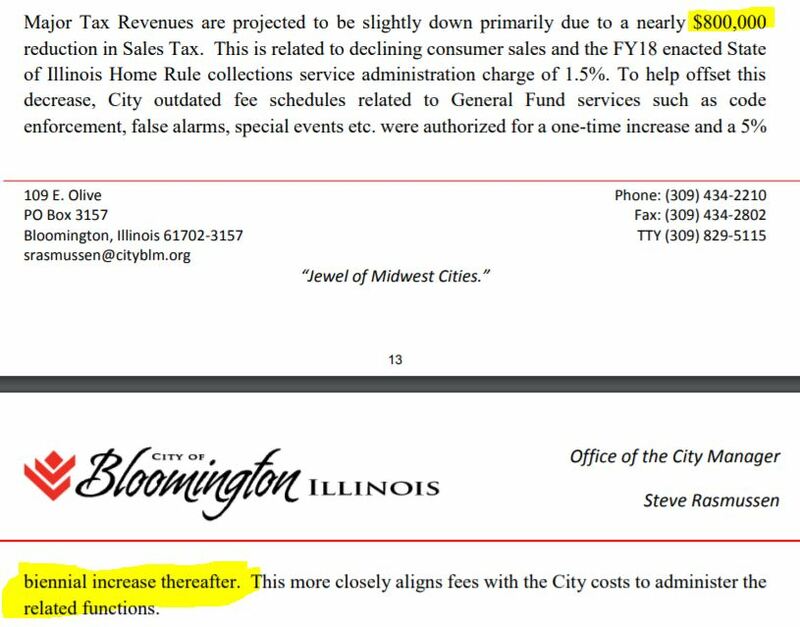 That means Sales tax revenue is expected to drop another $300.000. The Council already passed raising garbage fees every year (so they don’t have to), other fees are going to automatically increase every two years. Read between the lines. It claims cuts have been made to balance the budget. The chart shows expenses will keep growing while revenue is flat. Instead of cutting pension spiking, employee parties, travel, raises, entertainment, expanding the library, and administrative staff – how long before you are told there is nothing else to cut? We will again be hearing about structural deficits. If you had a structural deficit, it would mean you are spending more than you have in income. To the City, there is little they can do about it. 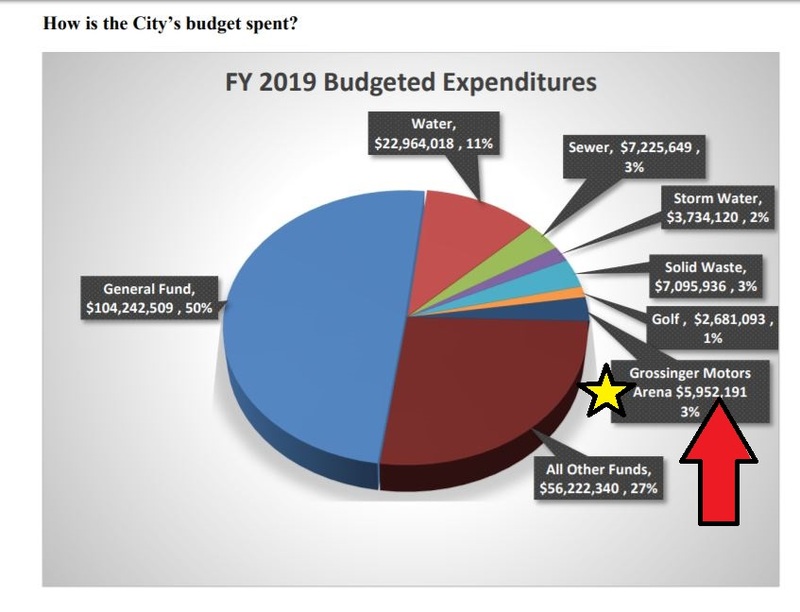 Posted in BloNo, Bloomington, BLOOMINGTON CITY COUNCIL, budgets, Local, Progressives, Renner, Taxes, Tim Gleason.Tagged 2019 budget, Grossinger Motors Arena, Sales tax decrease, structural deficits. Cost is right up there with solid waste and sewage. Coincidence? Stumpin’ for Renner when he ran for representivie, Communist/Socialist/Useless Obama’s Jewel of the Midwest. SAD! I don’t golf, but just THINK of the MAJOR events we could get here IF we didn’t have the MARKOARENA and instead had world class golf courses, and last I looked, golfers DO spend money! Thanks again JUDY M…. The Den was designed by Arnold Palmer and was to make Bloomington a destination. (Sound familiar?) The Den was built 25 years ago and only breaks even in operating expenses. The CVB, funded from hotel/motel taxes, does not leverage golf. There should be tournaments every weekend to draw visitors from outside of McLean county. The Arena does not even cover operating expenses. The expenses for the Arena always go over budget. Money is taken from other accounts to subsidize the Arena—robbing Peter to pay Paul—a shell game. The budget is all based on lies! Revenues will definitely decrease with our shrinking population. Then what will they cut? PS There’s a golf category but no roads? SMH! You will love (or hate) the next story. Roads are funded from the General Fund. Golf, Arena, Water, and Sewer are separate Enterprise Funds which are supposed to support themselves. Compelling evidence that the arena is a money drain. 5% of the entire city budget is required to cover losses. The $5.9 million plus loss is not even close to the tax revenue or economic benefits allegedly derived. We lose money every day its operations. The city should sell it for $1 and simply turn over the note (i.e. bond payments) to the buyer. Let’s cut our losses, folks. Unfortunately, no one in leadership has the guts to make a rational decision. I believe that number includes paying for the building, somewhere around $2 million. Meanwhile, shows aren’t scheduled for the upcoming busy season. And the breakdown (losses) for the BCPA are hidden where? Silly goose…the BCPA was never supposed to generate revenue. It provides quality of life and is under the Parks & Rec Department. So MANY shell games, maybe we OUGHT to open a sea side resort?? Seems since about 1980 EVERY mayor has HAD some idiot agenda! Arena, Downtown, Hotel, Golf course, but FUNNY, streets are NEVER an agenda, except in election years. Maybe we should paint them rainbow colors and put the bicycle riders in clown outfits and sell circus tickets, as that’s WHAT it ALL is! This is another BLNnews article that could help a viable candidate overcome an incumbent. Read and study. Know the basic content. Candidate must begin to establish name recognition the sooner the better. Do this by starting their own blog in regards to their ward or whatever area they seek to represent. Accept that if you are a good candidate that opposes the establishment of lies and idiocy, the establishment main stream media will deceitfully at first and then openly later, work against you. That is fact. Establish your blog site with yard signs and distributing flyers. Follow the council meetings and report how your opposition is voting. When evident, report how their vote really impacts the citizens of your ward and city overall. Update how past votes have affected the city. Quite simply, report the truth. People are starving for the truth and you will be noted for that. As some old campaign strategies are still very viable, one must stand out to build their name recognition. As far as politics is concerned, telling the truth will stand out, that is guaranteed! Also be VERY weary of establishment insiders that claim to be impressed with you and want to help. Chances are that they are a wolf in sheeps clothing. Watch very closely who you trust and how much you trust them on the campaign trail as politics is a dirty business. Good luck.